Fig. 2. Operating room configuration shows the surgeon with his dominant hand closest to the patient, sitting directly across from the TV monitor. Assistant sits at the end of the table and helps with management of the endoscope and other equipment. reflux, and in those for whom general anesthesia in contraindicated. In healthy, otherwise well individuals, general anesthesia with a laryngeal mask airway and intravenous sedation can also be safely used. Induction is achieved with a bolus of propofol followed by a maintenance dose during a very short procedure time. At the end of the procedure, the patients awaken quickly and can be discharged home within 1-2 hr. As with any endoscopic surgery, the video equipment is connected and checked for proper functioning prior to anesthetic induction. It is imperative that the appropriate orientation be obtained so that the TV monitor image correlates with the appropriate spatial orientation of the patient. The operating room set-up is somewhat different than the standard carpal tunnel surgery. The surgeon should sit with his/her dominant hand toward the patient. The TV monitor is then placed directly across from the surgeon, and the scrub nurse/ assistant sits at the end of the patient's extended arm. 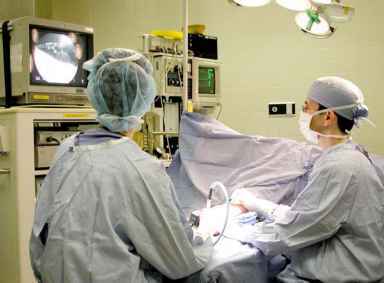 The scrub nurse is situated between the surgeon and the first assistant if one is available for the procedure (Fig. 2). Fig. 3. Intraoperative photograph shows the location of the two skin portals. 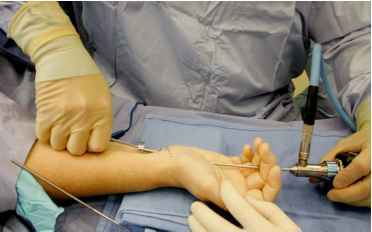 A proximal incision is made 1-2 cm proximal to the distal wrist crease ulnar to the palmaris longus. A second portal is made within a 1-cm circle located 4 cm distal to the distal wrist crease along the third web space. web space. Along that line, a point is marked 3 cm distal to the distal wrist crease. In most patients, this will mark the end of the transverse carpal ligament ±0.5 cm. 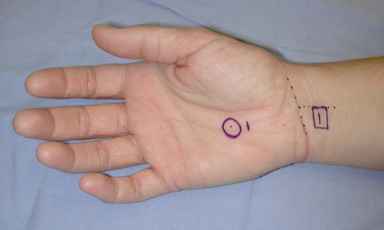 On the same line, another dot is marked at 4 cm distal to the wrist crease. and a .5-cm circle is drawn circumferentially around the 4-cm mark. This circle encompasses the safe area where the second distal portal can be made. One should note that the corridor between the proximal and distal portals encompasses an area where only the transverse carpal tunnel is present and where it is safe to section it. Following the induction of anesthesia, the arm is elevated, and a rubber Esmarch bandage is applied to exsanguinate the extremities. A tourniquet is applied and inflated to pressures above systolic, and the Esmarch bandage is removed. The hand is then freely held and placed in a slight extension on a pair of rolled-up towels. The proximal incision is made, taking care not to extend it more than 1 cm in the ulnar direction. Tenotomy scissors are then used to spread the subcutaneous tissue apart and allow visualization of the antebrachial fascial fibers. These are easily identified by visualizing white glistening fibers running in multiple directions. Following exposure of the antebrachial fascia, the fibers are spread apart bluntly with the tips of the scissors. Care should be taken not to cut the fascial fibers, as this may inadvertently lead to sectioning of a tendon. Following blunt dissection of the antebrachial fascia, the longitudinally running fibers of the tendons can be easily visualized. No attempt is made to visualize the median nerve. A pair of Adson forceps is used to grasp and elevate the distal edge of the divided antebrachial fascia. A synovial elevator is then gently inserted under the fascial fibers and advanced distally at an acute angle of approx 60° (Fig. 4). Fig. 4. The synovial elevator is placed through the dissected fibers of the antebrachial fascia and into the carpal tunnel. Note that the original angle of insertion is between 45 and 60°. Once inside the carpal tunnel, the tip of the synovial elevator is directed superficially in order to strip the synovium from the undersurface of the transversely running fibers of the transverse carpal ligament (TCL). This anatomical arrangement will produce a "washboard"-type sensation as the tip of the elevator moves across these transversely oriented fibers. By palpating this washboard sensation, the surgeon corroborates that the synovial elevator is inside the carpal tunnel. As the tip of the elevator is advanced distally past the distal edge of the TCL, the washboard feeling will disappear, thereby indicating the location of the distal end of the TCL. Once these internal landmarks are palpated and prior to removal of the synovial elevator, the antebrachial fascial edge should be grasped in order to maintain an open tract into the carpal tunnel. Next, an obturator-canula assembly is inserted into this tract beneath the TCL (Fig. 5). As the tip of the obturator is passed distally into the carpal tunnel, the patient's hand and wrist should be maintained in a neutral position. The obturator should be gently pressed radially against the hook of the hamate. This maneuver will ensure that Guyon's canal is not entered. Once the obturator tip is passed beyond the hook of the hamate, the wrist is extended to approx 30°. As the tip of the obturator approaches the previously drawn circle, the surgeon's nondominant hand is used to apply pressure over the obturator (Fig. 6). The tip of the obturator is easily felt under the skin and at this point, only the skin should lie between the surgeon's thumb and the obturator's tip. A #15 blade is used to create a small stab wound over the tip of the obturator, which is then gently pushed through this skin incision (Fig. 7). Fig. 5. The obturator-cannula assembly is inserted into the same compartment as the synovial elevator. Using the tip of the assembly, the "washboard" sensation can be felt, ensuring that the assembly is inside the carpal tunnel. Fig. 6. The surgeon's nondominant hand presses tightly against the skin over the obturator tip. As the assistant pushes the obturator handle, a scalpel is used to make a stab incision over the tip of the obturator. Fig. 7. 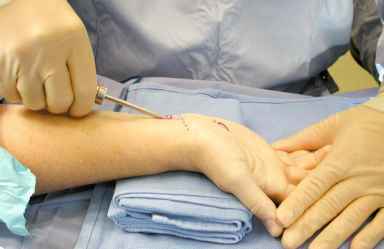 The obturator-cannula assembly inside the carpal tunnel. Note its entrance through the proximal portal and its exit within the circle located 4 cm distal to the distal wrist crease. drape over the edge of the ligament. A hooked blade is then inserted using the surgeon's dominant hand through the proximal opening in the canula (Fig. 10). As the endoscope is advanced proximally and the blade is advanced distally, these two instruments should come to rest close to each other. Following this, the blade and the endoscope are moved in unison with the separation of 0.5-1 cm. Before sectioning the TCL, care must be taken to note whether there are any longitudinally running fibers in the field of vision. If this is the case, one must suspect that a tendon is trapped above the slotted cannula. 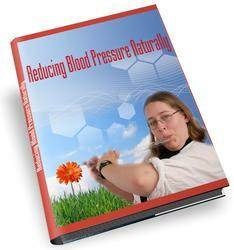 Care must be taken not to section any fiber that is running longitudinally, as this may be either a tendon or a nerve. Fig. 8. The obturator has been removed, leaving the open cannula in place. 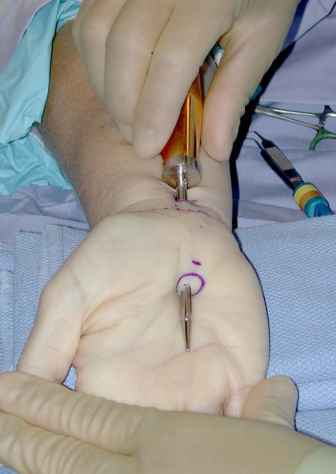 Note that the cannula has been rotated approx 15° ulnarward, thereby directing the dissecting knife away from the median nerve. severity of the syndrome, multiple passes may be needed to section the TCL in its entirety. Once the ligament is sectioned, the fat pad will fall into endoscopic view and obscure visualization. As this occurs, one can be assured that the ligament has been completely sectioned. 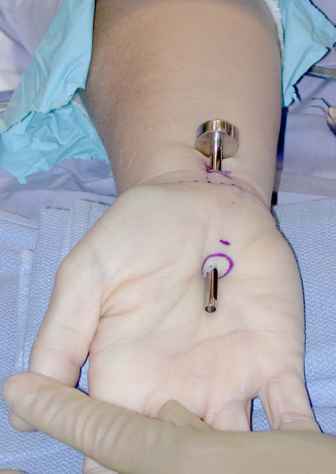 At this point, the slotted cannula is removed, and, if a Tinel's sign has been found preoperatively proximal to the distal wrist crease, a proximal volar fasciotomy can be performed using a pair of tenotomy scissors under direct visualization (Fig. 12). The tourniquet is taken down, pressure is applied, and hemostasis obtained as necessary. Several single nonabsorbable sutures are used to close the skin edges. To prevent hyperflexion of the wrist at the early stages, a short-volar splint is used, leaving the fingers free to be used. Sutures are removed within 1 wk, and the patient may return to full use of the hand after suture removal. Fig. 9. Drawings depict the transverse carpal ligament being sectioned midway. The wrist is slightly hyperextended as the ligament is sectioned. Lower diagram shows that only the ligament cut and the superficial structures are left intact. Fig. 10. 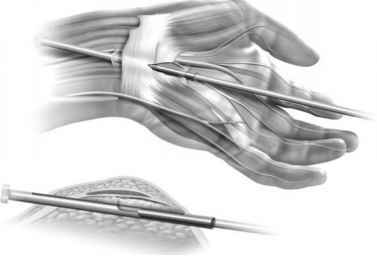 As the endoscope is guided with the nondominant hand, the hooked knife is controlled with the dominant hand and used to section the transverse carpal ligament under direct visualization.